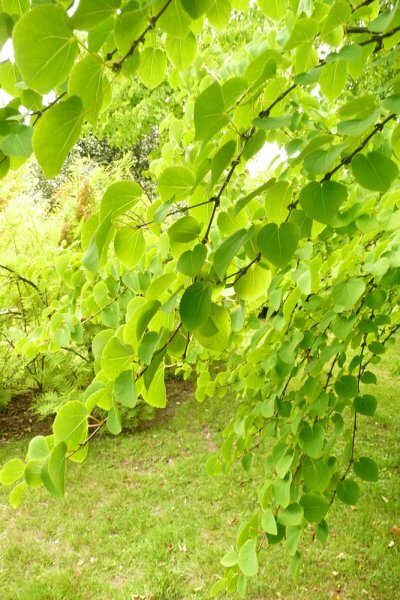 Katsura tree and Japanese judas tree. To 20m height and 15m spread. Slow, reaches its full height in 20 to 50 years (grows more rapidly when young then slows with age). Conical shaped tree. Male trees are more upright, females more spreading. 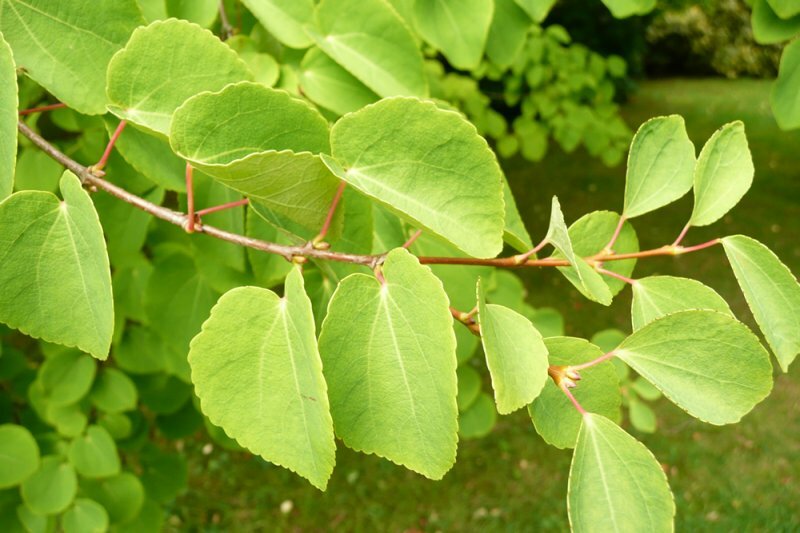 Attractive foliage, from spring to autumn, which changes colour with each season. 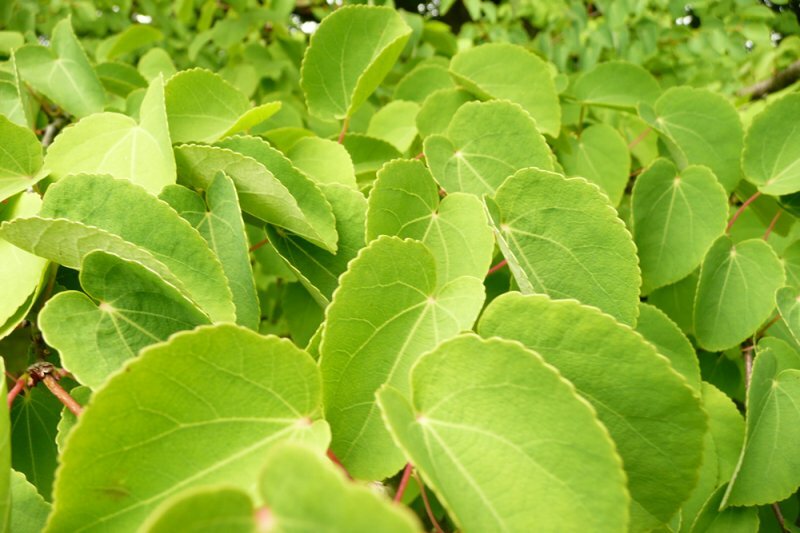 Tolerates any soil type, so long as it is nutrient- and humus-rich, but requires an acid or neutral pH (the leaf colour will be best on acid soil). Happy in any aspect, but prefers a sheltered spot to avoid drying winds and late fosts damaging the leaves. Doesn’t tolerate drought conditions. 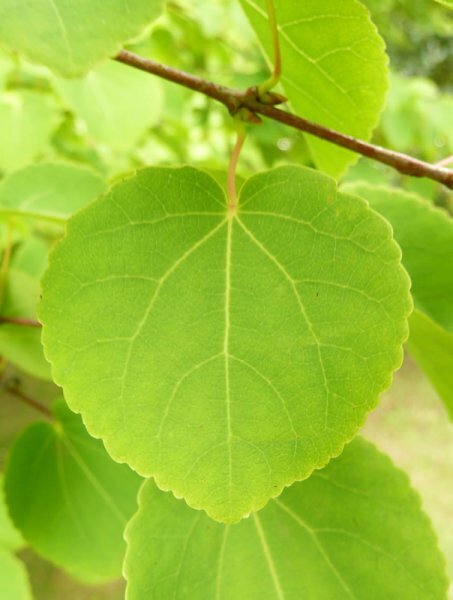 A medium sized, deciduous tree, usually chosen for its attractive, heart shaped foliage. 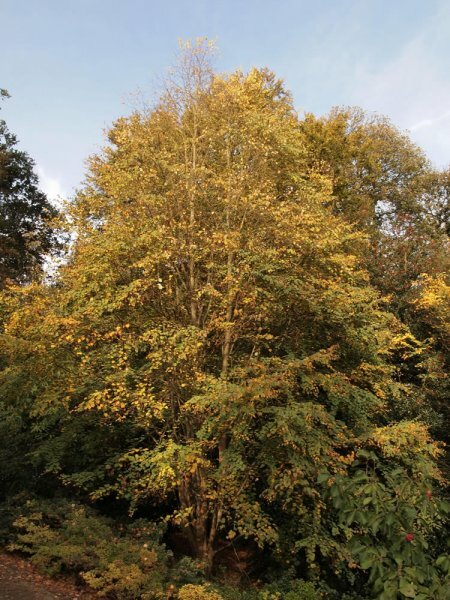 The leaves are bronze in spring, turning green in summer before putting on a wonderful autumn display of yellows, oranges and pinks. Fallen leaves smell of burnt toffee when crushed. Insignificant, dark red flowers may be present in spring. 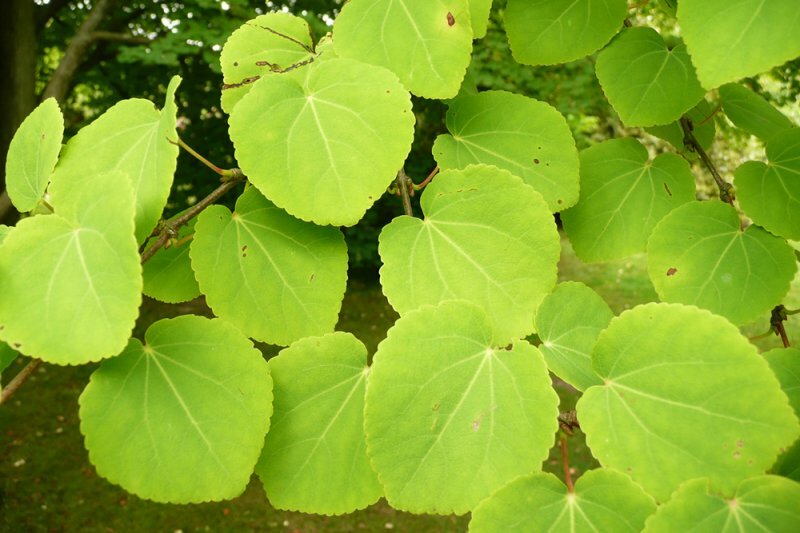 This plant is dioecious, so it requires a male and female to be present to produce fruit and seed. 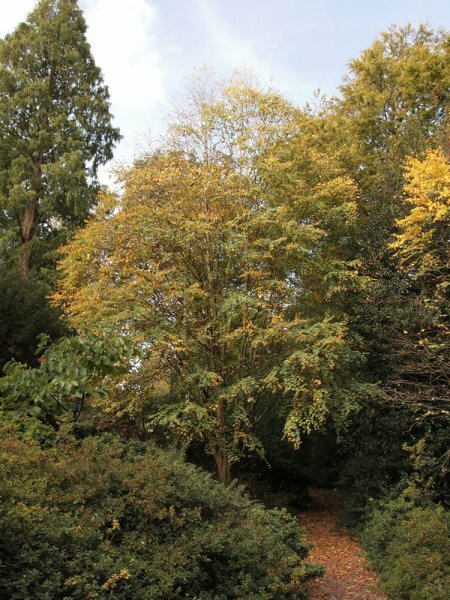 The changing foliage makes this a good specimen tree, or architectural feature in a larger garden, so long as its bareness in winter isn’t a problem. Works well in a woodland, where the shelter will protect the leaves from drying winds and frost. Would benefit from an annual mulch. Other than that, this is a low maintenance plant. All pruning should be done from autumn to late winter when the tree is dormant. No training is required, the tree will naturally form either a multi-stemmed habit or develop a central leader. If the tree grows multi-stemmed the lower lateral branches can be removed to allow under planting. The trunk of a central leader standard can be cleared to about 1.5m above ground level. Pruning of established trees should only involve the removal of dead, diseased and damaged growth. Frost damaged growth can be pruned out in late spring. This tree does not respond well to hard pruning. Seeds can be collected (this tree is dioecious so you will need a male and a female tree growing close to each to obtain seed) and sown in mid to late autumn, or stored in a refrigerator over winter to be sown in spring. If the seeds have dried out, soak them for a 48 hours before sowing. Sow outdoors in a seedbed, or in a cold frame. Germination will occur at 10-15°C, although you may have to wait until the second spring for them to appear. Alternatively simple layering can be used between late autumn and early spring. 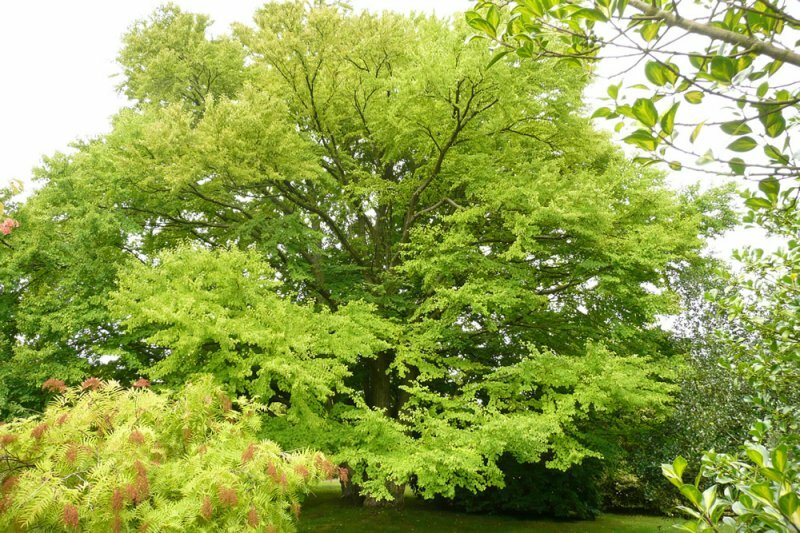 This tree has been given the Award of Garden Merit by the RHS.